During my years as an undergraduate, graduate student, and junior faculty member at Harvard, from 1953-1964, neurobiology was not recognized as a separate discipline. Indeed, the term neurobiology was not coined until the late ‘50s. There were, of course, faculty members in the college that today would be called neurobiologists. My undergraduate and graduate school mentor, George Wald, who studied the biochemistry of visual pigments and showed that vitamin A aldehyde (retinal) serves as the chromophore for all visual pigments, would be one, and John Welsh, an invertebrate zoologist, would be another. Welsh, for example, is credited with the discovery of serotonin and studied the effects of neuroactive substances on nerve and muscle. William Crozier, who studied the effects of flickering light on the visual system of many animals, would also be considered a neurobiologist today and, of course, Donald Griffin as well who investigated how bats evade objects and use sonar to find their way. Griffin was a prominent student of animal minds and cognition and is considered to be the father of cognitive ethology, the study of animal minds. In Psychology, there was George von Békésy, winner of a Nobel Prize for his ground-breaking studies on audition and how the ear works. Earlier at Harvard there were equally distinguished faculty who studied facets of brain function. Karl Lashley, in Psychology, was concerned with how memory is stored in the brain and carried out experiments on rats to localize where that might be. And much earlier, G.H. Parker was interested in the comparative aspects of neural function and studied the brains of many species, both vertebrate and invertebrate. In the late 1950s Stephen Kuffler, then at Johns Hopkins, was invited to join the faculty of the Harvard Medical School. At Hopkins, Kuffler had assembled an impressive group of scientists interested in neural function, including David Hubel, Torsten Wiesel, Ed Furshpan, David Potter and Ed Kravitz, and all came with Kuffler to Harvard. Initially housed within the Pharmacology Department, a separate department for the group was set-up in 1966, called the Department of Neurobiology, thought to be the first neurobiology department ever established. Many credit Kuffler with coining the term neurobiology as an interdisciplinary field investigating all aspects of neuronal function. Kuffler’s group at Hopkins was exceptionally well known and several members of the group including Kuffler himself and Hubel and Wiesel were interested in vision. Thus, in the mid-1950s, when I was still an undergraduate, Wald sent Tim Goldsmith, a graduate student of Wald who studied insect visual pigments, and myself, then learning how to record the electroretinogram (a field potential) from rat eyes, to Hopkins to visit Kuffler’s group. In 1964 after receiving my Ph.D. and spending three years as an Assistant Professor in Biology at Harvard teaching in Wald’s famous General Education Course, Natural Sciences 5, “The Nature of Living Things,” I moved to the Department of Ophthalmology at Hopkins, where Kuffler and his group had been, but into a newly constructed research building. There I remained for seven years. In 1971, I returned to Harvard and the Biology Department as a full professor. Implicit in my return was that I would establish a neurobiology course for undergraduates. With Michael Bennett, I had helped establish a summer neurobiology course at the Marine Biological Laboratory in Woods Hole that began in 1970. Soon after I returned to Harvard in the early 1970s, the Biology Department agreed to hire a junior faculty member to offer a more advanced neurobiology course, usually emphasizing invertebrate nervous systems. Over the years Bert Shapiro, Allen Counter, Ron Calabrese, and Dan Jay served in that capacity. Unfortunately, none were offered tenure and so I remained the only tenured neurobiologist in the Department until the late 1990s when two junior faculty members in the Department, Markus Meister and Catherine Dulac were given tenure in 1998 and 2001, respectively. Meister’s research at that time involved mainly the use of a multi-electrode array platform that he had earlier developed and that enabled him and his colleagues to record from many retinal ganglion cells simultaneously. He and colleagues had shown in earlier work, for example, that during retinal development, waves of electrical activity pass over the retina that are thought to play a role in the topographic representation of the retina in higher visual structures. Dulac studied olfaction, especially the coding of pheromone-mediated signals in the vomeronasal organ, as well as the identification of the receptor genes for pheromone sensing. My research interests, on the other hand, were on the vertebrate retina, using it as a model piece of the brain – its wiring, physiology and pharmacology. Since 2001, seven additional faculty members in neurobiology have been appointed in MCB – Venki Murthy, Josh Sanes, Jeff Lichtman, Florian Engert, Takao Hensch, Nao Uchida, Sharad Ramanathan, and David Cox – and when BMB and CDB were combined, Sam Kunes joined the ranks of neurobiologists in MCB. Thus, today virtually all aspects of neurobiology – molecular, cellular, systems, and developmental – are represented in MCB. In addition, other members of MCB, including Howard Berg, Alex Schier, Rachelle Gaudet, and Sean Eddy, work on neurobiological problems or issues closely related to neurobiology. Further, whereas much of the neurobiological focus in MCB has been on vision, including my research and that of Markus Meister, Josh Sanes, Florian Engert, Sam Kunes, and David Cox, the research has broadened considerably to include olfaction (Dulac and Murthy), neuromuscular synapses (Lichtman), sleep (Schier), cortical plasticity (Hensch), and decision making (Uchida). It is also the case that a number of model systems are now being used including flies, fish, and mice. In other FAS departments there are today numerous individuals working in the area of neuroscience, including Stanley Buckner and Ken Nakayama in Psychology, Bence Ölveczky, Yun Zhang, and Ben DeBivort in Organismic and Evolutionary Biology, Jeff Macklis, Kevin Eggan, and Paola Arlotta in the joint Medical School and FAS department, Stem Cells and Regenerative Biology, and Aravi Samuels in Physics. And, of course, there is much interest in neuroscience in several humanities and social science departments, including Economics, Philosophy, Linguistics, and so forth. There is also interest in neuroscience in the School of Engineering and Applied Science, and it remains strong and continues to expand in the Medical School and affiliated hospitals. 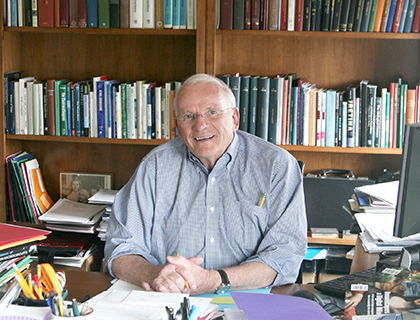 In the late 1990s the then Dean of FAS, Jeremy Knowles, proposed that there be established an interdisciplinary group for the study of the brain. He appointed a Committee that consisted of members from MCB, OEB, and Psychology as well as others interested in the brain sciences. Being on Sabbatical leave, I was not on the Committee when it was formed. The Committee suggested that a Center for Brain Sciences (CBS) be established that would include members from MCB, OEB, Psychology, Applied Sciences, and the Medical School. The Center was to have a home in the new Northwest Building where there would be established a state-of-the-art imaging center, including light and electron microscopy, magnetic resonance imaging, and so forth. A search was begun for a director, and Josh Sanes from Washington University was offered the position. He, along with his colleague Jeff Lichtman, arrived in 2004. Many faculty already at Harvard were asked to become members of the Center and a number of new appointments, joint with one department or another, were subsequently made. The Center is now 10 years old and has been a great success. Kenneth Blum was recruited to be the Center’s Executive Director and it is exceptionally active. Seminars are held virtually every day, the imaging facility is impressively outfitted, and CBS has become the focal point for the Brain Sciences in FAS. As early as the mid-1970s, it was clear that one introductory and one advanced neurobiology course were not sufficient to satisfy the growing interest and demand for courses in neurobiology in FAS. So at that time, I turned to the Medical School’s Neurobiology Department for help. Several intermediate and advanced level courses were subsequently offered for several years as part of the Biology Department’s curriculum including one on neurochemistry taught by Ed Kravitz, a second on synaptic physiology by Ed Furshpan and Dave Potter, and later a course on the neurobiological basis of disease by Ed Kravitz. In the early 1970s, not very long after I had returned to Harvard, there was an opportunity to expand neurobiology in FAS significantly that, unfortunately, did not come to pass. The Neurobiology Department at the Medical School was growing rapidly and had in its ranks several young junior faculty who were deserving of tenure and had been in the Department for some time, including John Nicholls and Zach Hall. The Medical School Dean, then Robert Ebert, recognized that he could not appoint additional tenured members of the Department; it was already at its maximal size. He called the Dean of FAS, then John Dunlop, to ask if FAS would be willing to take on additional neurobiology faculty. Dunlop called me to ask my views and I was exceptionally enthusiastic. It seemed to me that we would instantly have the best neurobiology in the world between the Medical School and FAS. The proposal was that Hubel and Wiesel, who already were tenured at the Medical School, would come to Psychology, which was increasingly interested in the interface between psychology and neurobiology, whereas Nicholls and Hall would come to the Biological Laboratories. The Hubel and Wiesel move would free up two tenured positions in the Neurobiology Department at the Medical School, and the plan would allow Nicholls and Hall to remain at Harvard. Space was identified for the four, and they were enthusiastic about moving across the river. However, there was strong opposition to the plan in the Neurobiology Department, especially from Kuffler I was told, and so the plan was scrapped. Nicholls and Hall left Harvard and no further tenured appointments were made in the Neurobiology Department at the Medical School for many years thereafter. Neurobiology and its intersection with physiological psychology continued to interest more and more undergraduates. In the early 1980s, Steve Kosslyn from psychology and myself from biology were asked to attend a meeting of the FAS Committee that approved Special Concentrations. The committee told us that they were overwhelmed with requests for special concentrations that combined psychology and neurobiology and that we (the two departments) should do something for these students. After consultation with colleagues, we proposed that two tracks be established, one in Biology and the other in Psychology, to meet this need. The Neurobiology track allowed certain Psychology courses to count toward the Biology degree and the Physiological Psychology track allowed approved neurobiology courses to count for the Psychology degree. These two tracks became popular and solved the problem. In Biology, it was an honors-only track and attracted as many as 100 students. In the 1990s, another opportunity to expand neurobiology and the brain sciences in FAS presented itself. President Rudenstine, in an attempt to draw together the various faculties at Harvard, proposed establishing a group of interfaculty initiatives. One of these was in the Brain Sciences and was called Mind, Brain, and Behavior (MBB). It attracted faculty from FAS, the Medical, Law, Divinity, and Business schools, as well as the School of Education and Public Health. A group of us, mainly from FAS but not exclusively, suggested the establishment of an undergraduate track program in MBB. The notion was to encourage non-FAS MBB faculty to teach undergraduate seminars, and also for MBB tracks to be offered in a variety of FAS departments. Today, MBB tracks are available in six departmental concentrations including Philosophy, Linguistics, History of Science, and Computer Science as well as Neurobiology and Psychology. Like the original tracks in Neurobiology and Physiological Psychology, all students take at least two foundational brain science courses including MCB 80, and also they can take designated courses from the other participating departments to fulfill requirements in their concentrations. When our proposal was presented and approved at a Faculty meeting, Jeremy Knowles, the Dean of the Faculty, arose and stated his support for the program, but also stated unequivocally that FAS would not provide any financial support for it. Subsequently, a small committee of alumni interested in the brain sciences was established by the University Development Office with the goal of raising funds for the MBB program. Headed by Robert Hoffman from Dallas, Texas, the Committee usually met twice a year, once in Cambridge and the other time in New York City. At these meetings, faculty, postdoctoral fellows, graduate students and even undergraduates described research projects undertaken as part of the program. The fund-raising results far exceeded our expectations – about $20 million dollars were raised in about five years, including funds for three chairs, undergraduate summer research, and so forth. Unfortunately, the Committee was disbanded in 2005, to be replaced by a Committee to raise money for neuroscience across the University. That, however, did not happen. An amusing story resulted from the establishment of the MBB Tracks. Soon after the program was initiated, we thought there should be some way to recognize those students who satisfied the requirements of the tracks, which included writing a thesis. It was decided to give each student a certificate signed by the Track Heads and the Undergraduate MBB Directors. We held a ceremony in the Faculty Club the day before commencement (which still happens) to give out the certificates in the presence of parents and friends. When other students in similar programs (especially language programs) heard of this, they asked if they could get certificates. The FAS Administration immediately said certificates had to be approved by the powers that be before any such recognition could be given, and that rules and requirements (not yet established) had to be met for a program to be designated a certificate program. There had been no certificates given before we did it, and we wondered if MBB would be chastised and our certificates forbidden. But never was a word said to us, and MBB continues to give out certificates each spring. Beginning in the late 1960s the Neurobiology Department at the Medical School initiated a graduate program, but there was no graduate program in Neurobiology centered in FAS, although all PhD programs at Harvard are under the jurisdiction of FAS. In the mid-80s, President Derek Bok formed a committee, which he chaired, and both the FAS and the Medical School Deans were members as were several others from both faculties, including myself who was then serving as Associate Dean for the Natural Sciences in FAS. The objective of the Committee was to see if greater interactions between the two faculties could happen. One idea was that there be established joint graduate programs between the Medical School and FAS. At that time, there was one such joint graduate program, in Biophysics, initiated and still led at that time by a medical school professor, Arthur K. Solomon. A number of us in FAS were members of that successful program and trained graduate students from the program. After Steve Kuffler’s untimely death, Torsten Wiesel was appointed chair of the Neurobiology Department and one of his first initiatives was to establish a University-wide Neuroscience Graduate Program that included faculty from many of the Medical School Departments, several FAS Departments and researchers from various hospitals and research institutes. It was called Neuroscience to reflect the broadening base of the brain sciences from biology and psychology into many disciplines including economics, computer science, linguistics, and so forth. On the Steering Committee for the program were faculty from the Medical School, FAS, and hospitals, including myself. The Neuroscience Graduate Program thrived and although the Neurobiology Department continued their graduate program for several years, they eventually gave it up so that today we have a single University-wide Neuroscience Graduate Program. It is also the case, of course, that students in various departments can do their thesis research with neurobiologists/neuroscientists throughout the University with approval from their home departments. Today (2015), for example, about one-third of the MCB graduate students carry out neurobiological research for their dissertation. Interest in integrating neurobiology and neuroscience across the University continues, especially as the brain sciences today impact so many areas of inquiry and continue to grow in terms of numbers of interested parties. In the early part of the last decade, as planning for the use of Allston land was being considered, serious thought was given to establishing a University-wide Neuroscience Department that would be housed in Allston. There was spirited debate on both sides of the river as to whether this would be a wise thing to do, but before any decisions were made, the financial crisis of 2008 put an end to the discussion, as all plans for developing Allston were put on hold. A new initiative, called the Harvard Brain Initiative has recently been started (2014) and its leaders are Josh Sanes, Director of CBS in FAS, and Michael Greenberg, Chair of Neurobiology at the Medical School. The Initiative sits under the Office of the Provost, Alan Garber, but what form it may take is as yet uncertain. Funds for the Initiative are being sought as part of Harvard’s current billion dollar fund drive, and it is likely that the monies raised will significantly impact the nature and extent of the Initiative. My last semester as an active faculty member was spring 2015, but on July 1 of that year, I became a Research Professor which will allow me five more years of teaching (now a Freshman Seminar) and research in the field. It has been exciting and gratifying to see the development of neurobiology and neuroscience in the University, especially in FAS, and much more development is certain to come. 1 The division of the Biology Department into MCB and OEB was more complicated than this suggests. First biochemistry split off from biology forming the Department of Biochemistry and Molecular Biology (BMB). Then biology split into two divisions, Cellular and Developmental Biology (CDB) and OEB, which eventually became two Departments. Finally, BMB and CDB joined together to form MCB. 2 During the discussions regarding the establishment of the six life sciences concentrations, one issue was whether to call the neuro-concentration neurobiology or neuroscience. The decision to call the concentration neurobiology was taken to emphasize that the concentration would focus on the biology of neural phenomena at all levels.